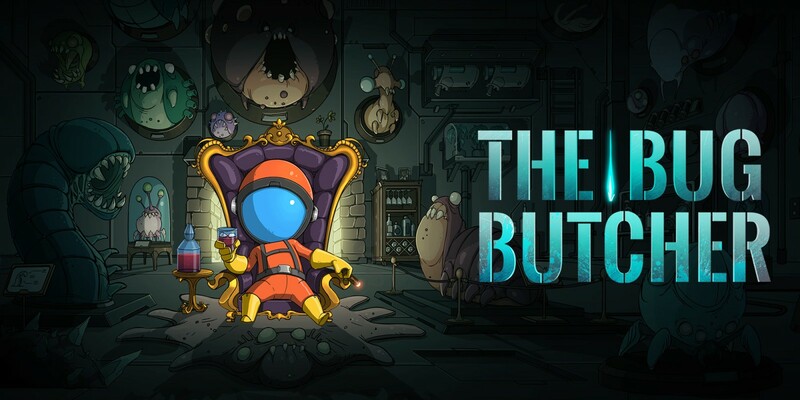 The Bug Butcher is a 2D scroller action shooter game where you play as the acclaimed Bug Butcher. When bug-like aliens go evil, who are ya gonna call? The Bug Butcher! The Bug Butcher is fast-paced and is a lot of fun, especially when playing with a friend. The Bug Butcher’s levels keep all of the action on stages for every level. Rather than an adventure where you explore and shoot bugs, you’re locked into a room where the bugs come at you in waves. The alien bugs generally bounce around or fly above you, so your gun is automatically aimed up. The main thing you have to do as the Bug Butcher is run left and right with the analog stick, occasionally dash with the down button, and hold down the right button on the Joy-Con to rapidly shoot bullets. There’s no need to reload or anything, which is quite nice. Of course, you only have so many hits you can take before you die. If you’re playing in multiplayer mode, then your teammate has a few precious seconds to revive you. Otherwise, you spend the level running and dodging the alien bugs while trying to shoot them down. As you kill the bugs, coins and other cool power-ups will drop from them. Every so often, you’ll have the opportunity to buys upgrades with the coins. These upgrades may be power-ups for your gun, extra health for yourself, or even a shield that takes a hit for you so you don’t take damage on the first hit. With these upgrades, a little bit of strategy can be involved, but you never know what kind of bugs will be heading your way next. You just have to prep yourself for the worst. The graphics are clean, crisp, and bright when it comes to the characters. While the backgrounds are nicely detailed, they usually remain in shades of gray and black so you can focus on your character and the usually brightly-colored aliens that bounce around. The alien bugs are certainly well designed. Most of them were gross-looking so they did their job in making them look unappealing enough. Each different kind of bug had a unique look about them. All the scientists looked the same and the Bug Butcher looked different aside from them. The bugs were the ones who stood out which was certainly a nice touch. The music of the game was fun and catchy, too. The music definitely got you in the mood to shoot down some bugs, giving you a James Bond-like musical score to defeat the aliens. Of course, there were times when Rachel and I were shouting over the music, but they were still great tunes to listen to, nonetheless. You play as Harry, the Bug Butcher, who has been called upon to exterminate all the bugs. They’ve broken into the science lab and are determined to eat all the scientists. The scientists can’t do too much about it, though they help you on a technical standpoint during each stage. Unless you’re in the elevator… then the scientists hide. It’s a bit of a silly story, telling about how alien bugs have joined humans on earth, but some of the aliens are still jerks, so Harry has made a niche for himself by becoming the Bug Butcher. Harry’s few pieces of dialogue paint him as an exasperated anti-hero rather than someone who is gung-ho about saving the world, greatly amusing us. The game is a fun way to pass some time and there are a couple of different modes that you can play. While the main campaign is single player, and I would have really liked to see it able to be played with a friend, there are some tag team modes which were fun to play. Unlocking different types of guns and traps for the aliens is a great challenge and it was fun exploring those options whenever they popped up in the chaos of the levels. Overall, the Bug Butcher is a solid game. It’s fast-paced, fun, and has the ability to share it with a friend. It’s a game I can see myself going back to from time to time and attempt to beat my time scores.